Even when not watching Cabaret, we’d all be happy to be greeted with these words, wouldn’t we? Such harmless pleasantry – what could possibly be wrong with treating customers like this? Well, in some contexts, nothing at all. At the cabaret or other entertainment extravaganza, “Welcome” is… welcome. And I’m sure we’re all familiar with “Welcome aboard this flight/train/coach to Los Angeles/Milan/Basingstoke”. Here, too, I’m perfectly happy to hear it. It’s traditional, it’s courteous and, more to the point, it reassures me that I have come to the right place and I have chosen well. It works on planes, trains and automobiles because those customers have already made their buying decision. “Welcome” confirms their excellent taste and discernment (with the possible exception of those who chose to travel to Basingstoke by coach). So this kind of wording is great for re-affirming customers’ choices. However, it’s less good at capturing attention and persuading, as I hope to show. 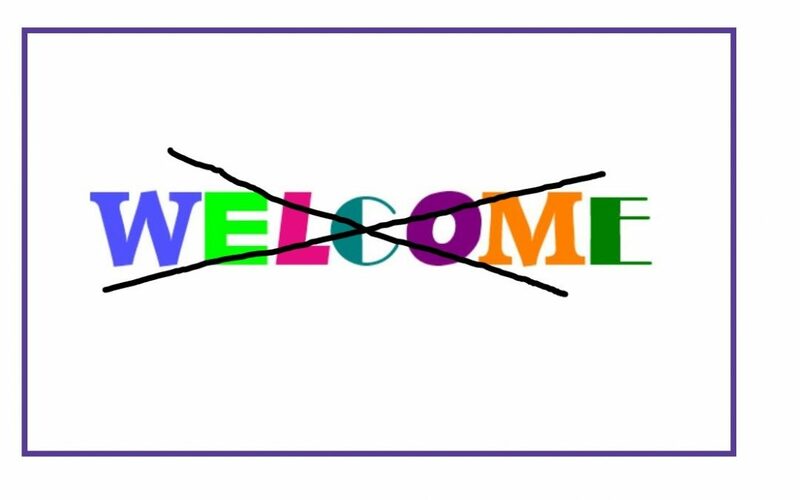 It’s all too common to see “Welcome” used on websites, leaflets, even email newsletters. I chose it myself when I was a fledgling writer creating my own website content. For the same reasons that everyone else chooses it – I thought I needed some sort of introduction, and I wanted to appear polite and approachable. (Because I am, really.) I may even have used an exclamation mark for added friendliness. A hint or two from a marketing expert helped the penny drop for me. Customers who reach your website or pick up your leaflet are likely to form an opinion within seconds. If they haven’t been hooked by your message in that time, they may well move on to something else and spend their money there instead. So here’s the main reason why “Welcome” may be a Bad Thing: it wastes valuable time and space. Time and space that should be telling the customer exactly why she should buy your products or your service. Or at least intriguing her enough to make her want to read more. This is not just being coldly mercenary. It’s a courtesy to readers who have little time and want to be helped to make the right decision for them. It’s lazy. It’s a quick fix because you can’t think of anything better. Yes, it’s understandable that you would do this (remember, I did it myself). But the trouble is, it can look like you can’t be bothered. It’s not about your business. Anyone can use “Welcome”, as we’ve seen. It says nothing specific. If it can be used by accountants and art teachers, car salesmen and caterers, then it’s not helping to highlight what you do. It belongs to everyone and no-one. It’s not about the customer. This is the big one. The first few words on the page should state a clear benefit to the reader – what will she get out of buying from you? How will her life be enriched? What does she want or need that you’ve got? Maybe she doesn’t know she’s got a problem that needs solving with your products or services. Here is your chance to tell her. And no, writing “Hello” or “Greetings” at the top in fancy letters is not a reasonable substitute. Now you want to know what to write instead. A worthwhile exercise is to think of a phrase with three or four words that sums up your business. It needs to be specific, and it needs to be true. You pride yourself on being relaxed and cheerful? Friendly and flexible – how does that sound, for starters? It still might not be very specific, but it’s a whole lot better than “Welcome”. If you can sum up your business benefits in such a short phrase, you’ve done very well. You may find you have to use a few more words to get your message across. But forcing yourself to think about it will be worth it in the end. Have you found this useful? Then I’m pleased to have been of service. In fact – you’re welcome. Are you wondering whether your writing could benefit from an editor’s eagle eye? Take advantage of a friendly Free Appraisal.